At Little River Cafe, our poached Salmon was a constant favorite. As with the leg of lamb, it seemed that less was more: Salmon doesn't deserve being masked with sauce or over-prepared. After working on his boat, Jacques would go to the Noyo harbor and choose every fish by feel, since the first secret to good fish is absolute freshness. With salmon, a simple preparation and sauce is always best. Prepare a court-bouillon of one cup dry white wine, 1 quart water or light fish stock, one onion and one carrot, both chopped, several parsley stems, 1 tsp. sea salt, a sprig of fresh thyme or 1/2 tsp. dried, 1 bay leaf, and 6 peppercorns. Bring to boil and simmer 1/2 hr. Strain it into a deep flat pan or fish poacher, bring to boil and gently add Salmon fillets or steaks of 1/3 to 1/2 pound per person. Adjust heat to keep it just at the simmer point while they poach, about 7 minutes. Meanwhile, in a small pan floating in the poacher, melt for each fillet: 3 Tbsp. sweet butter, with the juice of one-half lemon, 1/2 tsp. CLOUDS BLEND HERBS, and some finely-chopped parsley. When the salmon flakes with a fork and has just become opaque in the thickest part, remove, drain well, and serve on a warm plate with the lemon-butter sauce. Very simple, very good. One reason it's such fun to make fresh pasta is that you can flavor it any way you like. My first thought for this lovely fragrant blend was to put it in pasta dough, and yes, it is very nice! Place flour in a mound on a large clean surface, and make a well in the center. In it place eggs, oil, salt, and CLOUDS' BLEND HERBS and mix well with a fork. Using the fork, begin incorporating flour from the inner rim of the well, sweeping new flour from the lower part under the mixture to keep it from sticking to the board. Mix as much as you can with the fork, then press your (lumpy) dough together with your hands. Shake what remains loose on the table through a sifter. Discard lumps and place your ball of dough into the loose sifted flour. Knead by hand, pressing with the palm and folding over the edges, for about 3 minutes, incorporating loose flour. It should be smooth and elastic. Let it rest 5 minutes, then follow pasta machine instructions. It is very quick and delicious. *For an amusing presentation, make a pesto log. Mix all ingredients, arrange along the edge of a piece of waxed paper, roll snugly and chill till firm. Cut in thick slices to garnish each portion of fresh CLOUD 9 pasta. In France cucumbers are often salted to release some of their liquid, which can be bitter depending on the season. Then the wilted slices are tossed with cream, tarragon and a little vinaigre, for a lovely light addition to salads or plates of crudités. Toss in a colander with1 tsp. salt, and leave to drain for one hour. Mix in a bowl with 1/4 cup cream or sour cream, on tsp. 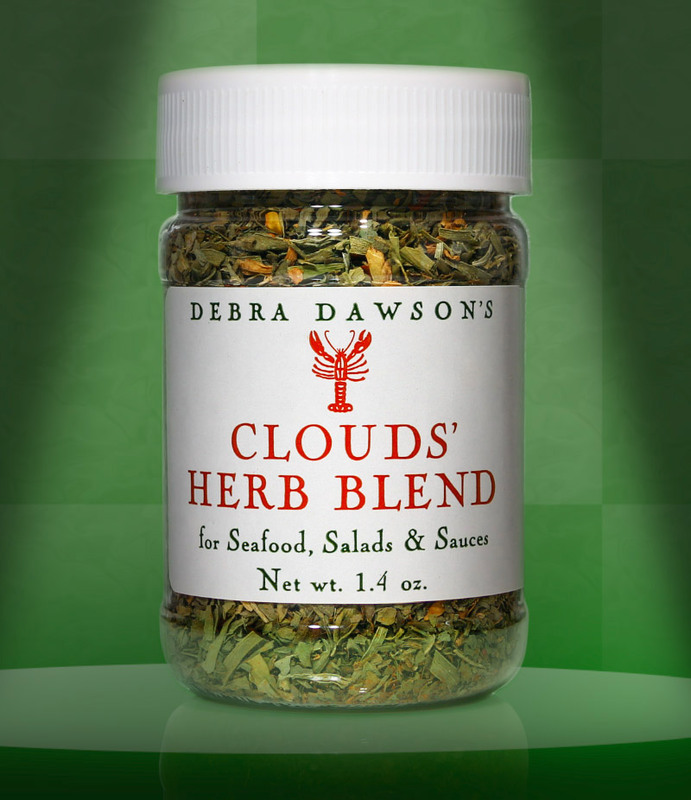 CLOUDS BLEND HERBS, and more salt and pepper to your taste. Add chopped parsley or scissored chives to garnish, serve in a colorful medley with garden tomatoes and roasted beets, or use to garnish a green salad. Toss with green beans or buttered carrots. Make a new version of herbed cream cheese. Substitute for fines herbes in a cheese omelette. Add to your favorite salad dressing. Add to white wine vinegar and steep for two weeks. Toss with fresh or pickled beets. Add to butter for dipping fresh asparagus. Combine with flour and salt to dust fish for sauteing. Another dip for the vegetable buffet: Clouds' Blend Herbs with lemon juice and sour cream, salt to taste. Boil artichokes with lemon juice and Clouds' Blend Herbs added to the water. Dip in raspberry vinaigrette or melted butter with a sprinkle of herbs.